- A collection of short poems. - He Stands Among Us Still! 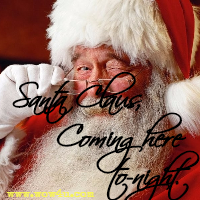 - Christmas Is . . .
- Oh, Mary, How Could You? for this special season you see. and that should be our prayer. who helped others all year through. It is time to love your brothers. Where fighting actually does cease. When the world seems anew. Still stops our world and shines a glow. we see people's attitudes and caring ways. To ensure this Christmas is one that will bring happiness. To help others and to love one another. And happiness would be for all. And I do believe it's grand. Let's share this message, amplified. Don't let Christmas be a time to ignore good friends. 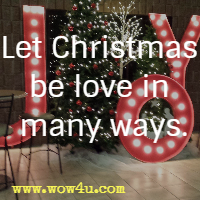 Let Christmas be love in many ways. Take the time to tell your love ones just how much you care. With so much love it is hard to measure. With music filling the sound. As they look forward to Santa and new toys. that we celebrate this holy season. And then tries two, three, four, and five. Dolls, books, trumpets, when he comes. Make them round and stiff and still. 'Cause it's near to Christmas day. I will let you choose and no matter I will be happy indeed. We get lots of snow so you could bring me a sled. When you get here make sure to look at my tree. For the reindeer I will leave carrots too. 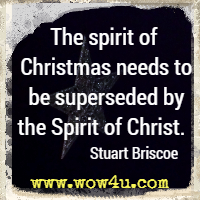 The spirit of Christmas needs to be superseded by the Spirit of Christ. The spirit of Christmas is annual; the Spirit of Christ is eternal. The spirit of Christmas is sentimental; the Spirit of Christ is supernatural. 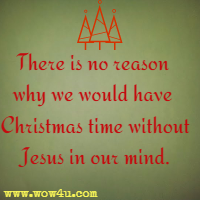 The spirit of Christmas is a human product; the Spirit of Christ is a divine person. Hold no grudges and quickly make amends. Love is stronger this season of Yule. If love and peace would stay, if only it would! If this feeling would stay troubles would dispel. And fills us with goodness and lots of love. Their silvery beams rain below. The stringing, the children's desire. For it is the hour of prayer. That eased our cares ere it ceased. How wonderful childhood must be. And wish they were coming my way. As the old year comes to an end. "Mary, we're so disappointed; how could you treat us so? What about our reputation? Folks will find out you know. We thought we warned you discreetly, but it's clear, you just didn't heed. What will we say to our neighbours? She gave into his greed?" Joseph is not this child's father; he's the child for whom we have prayed. I was alone in my bedroom and an angel came in the night. He spoke but I barely heard him, my body was shaking with fright! God has chosen my body to nurture our heavenly king! He is the child we have longed for; the promise that helped us to cope. God, being faithful, has heard us, and He is rewarding our hope. But Scripture long ago told us that God had all of this planned. Like me, he too is God's servant. We're honoured, it's not a disgrace!" Our blessed Way, and Truth, and Light. It's not getting Christmas cards out on time. and giving us the gift of eternal life. A king whose robes were laid aside, He came to rescue me. The One who formed this very earth lay in a hay-strewn bed. “Behold! The King of kings has come!" Yet earth was not prepared. He loved us so! He gave His life, what joy! What liberty! We celebrate this won’drous birth, so let our voices raise! Let hearts salute across the world and give to God the praise. Rejoice! Rejoice! The Lord is born; the Son of God is here! No greater gift can man receive; Rejoice, be of good cheer!